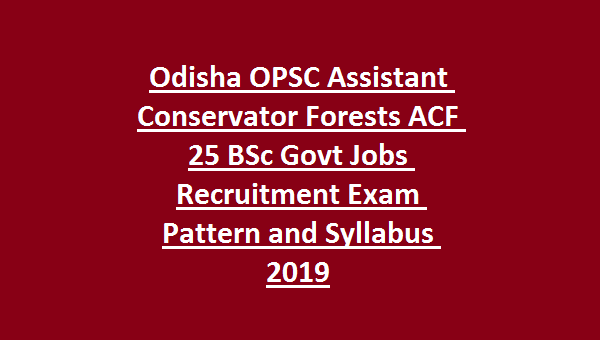 OPSC Assistant Conservator Forests Jobs Recruitment 2019: Odisha Public Service Commission (OPSC ) invites applications from the B.Sc on Engineering qualified candidates for the recruitment of Assistant Conservator Forests (ACF) posts. 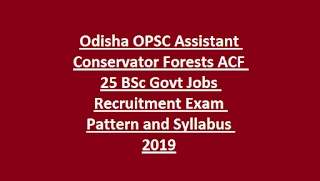 There are total 25 ACF vacancies are available in this Odisha Public Service Commission Assistant Conservator Forests ACF OPSC recruitment 2019. Candidates who qualified B.Sc Forestry or other science subjects or Engineering Degree they can apply online for this OPSC ACF Jobs through the OPSC website of www.opsconline.gov.in. Last date to apply online for this Odisha Public Service Commission OPSC Assistant Conservator Forests Jobs 2019 is 14-03-2019. Online application link will be available from 15-02-2019. Selection for this Odisha Public Service Commission Assistant Conservator Forests OPSC-ACF Jobs Recruitment 2019 will be based on written test physical tests and Interview. Available vacancies, ACF Exam Syllabus, ACF Exam Pattern, Salary, ACF Posts age limits, ACF qualifications, OPSC ACF jobs online Application procedure and other details of Odisha Public Service Commission Assistant Conservator Forests vacancy Recruitment 2019 are mentioned below. There are total 25 Govt Vacancies are available in this OPSC Assistant Conservator Forests Jobs Recruitment 2019. Post Name: Assistant Conservator Forests ACF - 25 posts. For ACF jobs-Candidates who are qualified B.Sc Forestry, or B.Sc Agriculture or other Science subjects or Engineer Degree they are only eligible to apply online. To apply online for this OPSC ACF posts candidates must have 21-32 years of age limits. The upper age limit for SC/ST/SEBC candidates is 37 years. Candidate who are selected as a Assistant Conservator Forests will get monthly salary of Rs.44900/- plus allowances as per OPSC or Odisha State Govt rules and regulations. Selection of candidates for OPSC Assistant Conservator Forests Jobs will be based written exam, physical tests and interview. Written Exam (Online test) pattern/ Syllabus and other details will be updated below. Height for Male candidates is 163 cms and for female 150 cms. Chest for Male is 84+5 cms and for female is 79+84 cms. Exam fee is Rs.500/-. Written Exam will be held in Cuttack only. Eligible candidates can apply online for this OPSC ACF posts from 15-02-2019 to 14-03-2019 via the Odisha Public Service Commission official website @http://opsconline.gov.in/. Candidates are advised to visit OPSC website regularly for latest updates about ACF Exam date, Hall Ticket, ACF Exam Pattern and Syllabus, result details.